Pop the champagne cork! I’ve cooked 100 recipes! Actually, I’ve officially cooked 107 recipes (if you count tonight’s dinner). The 100th happened a few weeks ago, on the second of May, and honestly, I didn’t even realise until just a few days ago. Things have been a bit crazy lately. So who wants to know what the 100th recipe was? It was Roast lemon chicken with Sicilian olives, the cover recipe from May 2008. I’ve made it before, back in May 2008 probably. It was yummy then and it was still yummy now. There is something about the smell and taste of slow-cooked onions. Add thyme to the equation and I am in heaven. 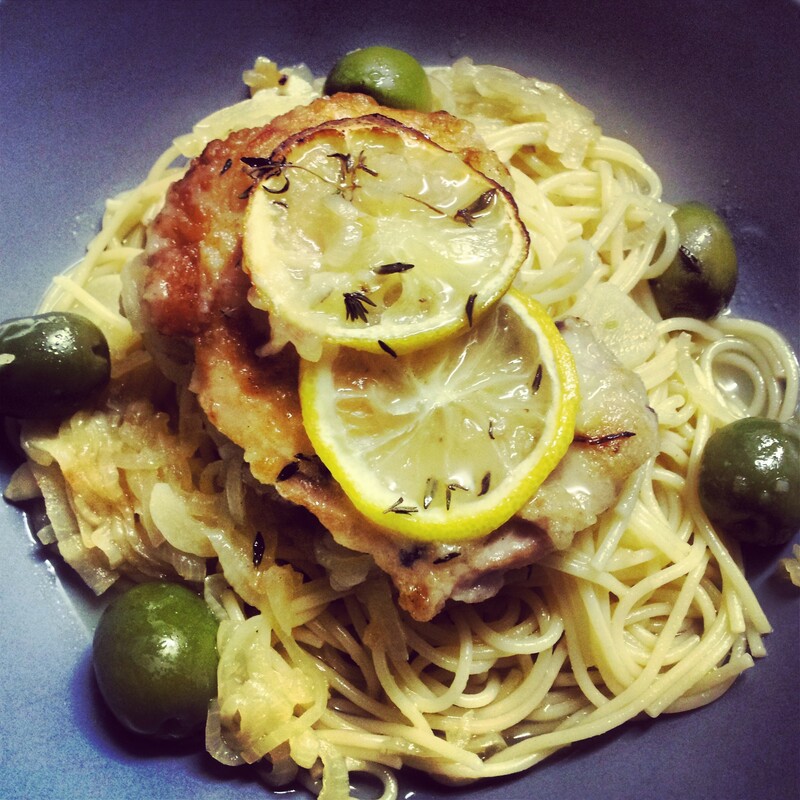 Keeping with this month’s Italian theme, I served the roast lemon chicken on spaghetti which had been lightly tossed in butter. A little bit extravagant, but indeed delicious. If there is one piece of advice I can give you when making this recipe, it’s make double. You’re gonna want to eat this meal again! Heat 2 tbs of the oil in a large frypan over medium-low heat. Add onion and garlic and cook, stirring, for 20-25 minutes until soft and pale golden. Season, then stir in thyme leaves. Spread onion over the base of a roasting pan that will fit the chicken snugly in a single layer. Sprinkle over the thyme sprigs, then set aside. Preheat the oven to 190 degrees Celcius. Heat remaining oil in the same frypan over medium-high heat. Dust chicken in flour, shaking off excess, then cook in 2 batches for 3-4 minutes each side until golden-brown. Arrange chicken over onion, then overlap 2 lemon slices on each. Squeeze over the juice from any remaining lemon slices. Meanwhile, bring stock to the boil in a saucepan, stir in the preserved lemon rind if using, then pour around the chicken. Cook in the oven, uncovered, for 45-50 minutes – adding olives after 30 minutes and basting with stock 2-3 times – until chicken is golden and cooked. Stand in the pan for 5 minutes, then transfer chicken, onion, olives and juices to a deep platter to serve. * From delis and gourmet food shops. This month we are stepping back a gear and putting on our slow shoes. Autumn is here. The nights are getting cooler, the sun is setting sooner, and our tummies are looking for something warm and comforting to fill the void. This month I have chosen a Jamie Oliver recipe for Pappardelle with amazing slow-cooked meat. It’s clearly a winner. In fact, one of the downsides to immersing yourself in ten years of delicious. Magazine’s is that you come across certain recipes that have popped up on more than one occasion. This is one of those. It was first printed in the May 2004 magazine and again reproduced (word for word!) in the May 2006 magazine. Worth cooking don’t you think? I have included a whole bunch of “tips” in the recipe and shopping list this month including instructions for preparing this recipe with your slow cooker. All the details for the May cook-a-long can be found here. Don’t forget to mark Wednesday 8 May in your calendar. I had so much fun with the April cook-a-long and was thrilled by how many people joined in. May is going to be even better. I can’t wait to see what sort of creations you all come up with.